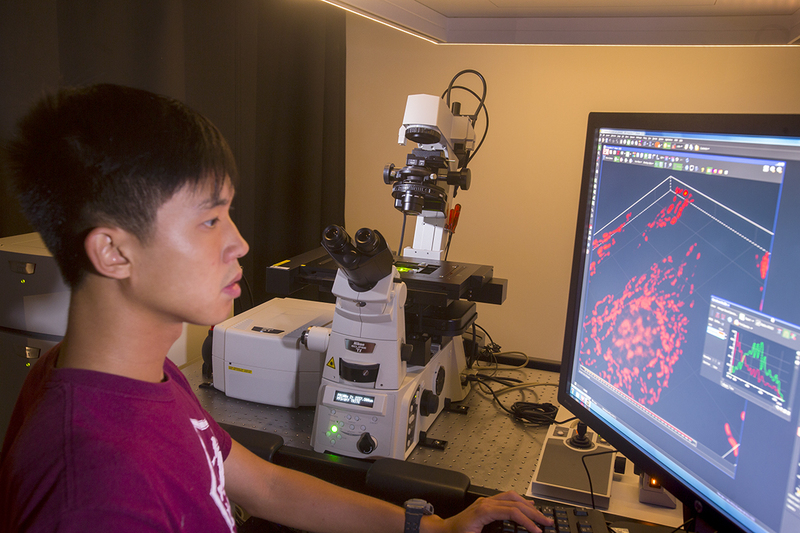 Located on the 5th floor in the Life Science Laboratories the Light Microscopy facility provides powerful resources for imaging model organisms, tissue, cells, biomaterials, and artificial structures and houses state-of-the-art equipment including almost every light microscopy imaging modality currently available. Cell culture facilities are also available as well as other routine needs for biological imaging. This facility is one of a few designated Nikon Centers of Excellence providing a unique opportunity for training, demonstration, instrument development, and research. The benefits of working with Nikon as an industry collaborator are that UMass Light Microscopy Facility users receive formal and informal training from Nikon engineers, frequent on-site technical support, access to new hardware and software technology, and assistance with cutting-edge experimental set ups. This microscope is very versatile and can be used for live or fixed samples. The resonant scanner allows for very fast acquisitions and the GaAsP detectors are extremely sensitive. The SIM side of the microscope is extremely easy to use with no special sample preparation required for super-resolution imaging. 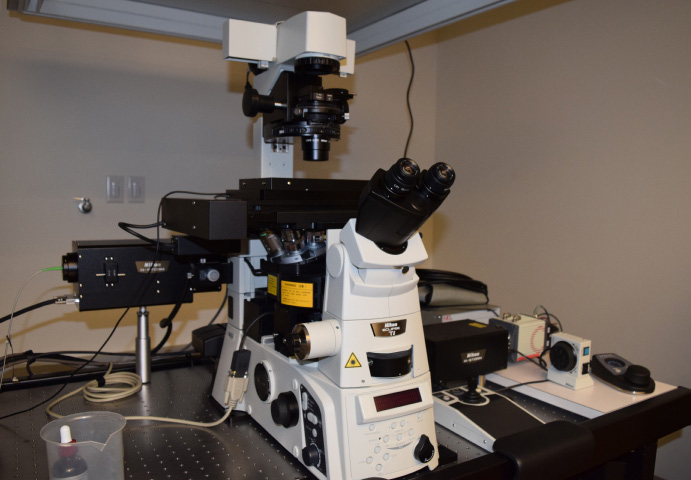 This microscope is great for live cells as it is a low-light technique. With four laser lines and an additional mini-scanner for PA/FRAP/etc., we can easily image dynamic movements in live cells, stimulating/bleaching in real time. Laser lines: 405, 488, 561, 640nm for imaging and 405, 488, 561, 640nm for photoactivation/bleaching/etc. This microscope is really a cellular robot. You can find cells or regions using brightfield or fluorescence that you are interested on tissue slices and draw a line around them, cut them out, move them to a cap and then process the cap for downstream experiments (sequencing, proteomics, etc.). 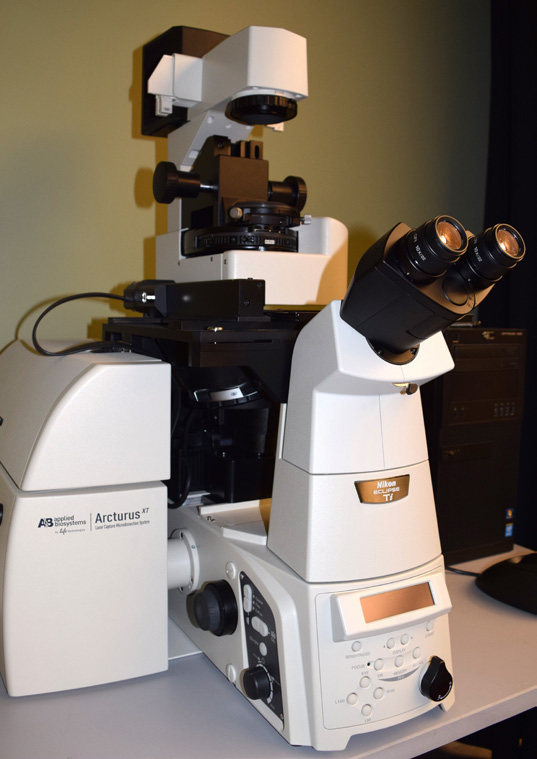 This microscope is highly versatile and can be used for live or fixed samples. The resonant scanner allows for very fast acquisitions and the GaAsP detectors are extremely sensitive. 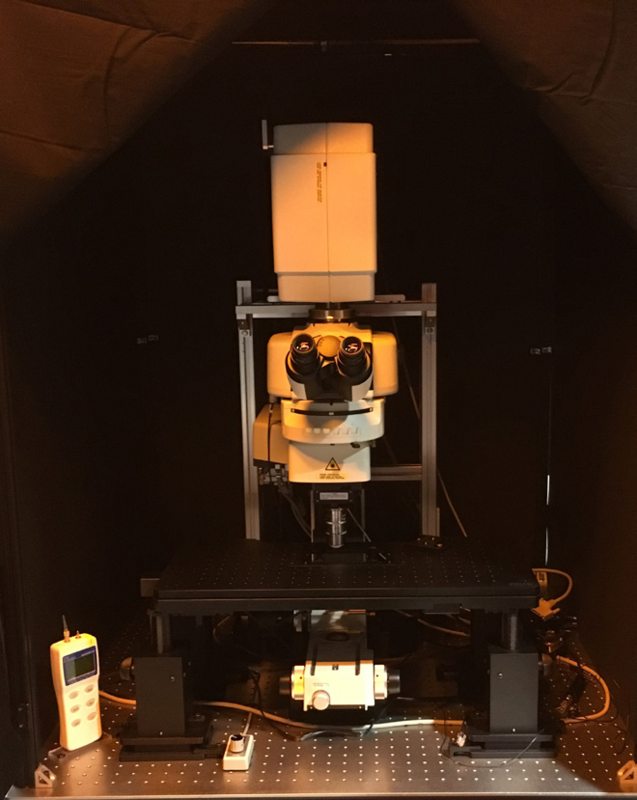 This microscope has 6 lasers and the full gamut of objectives and software modules. 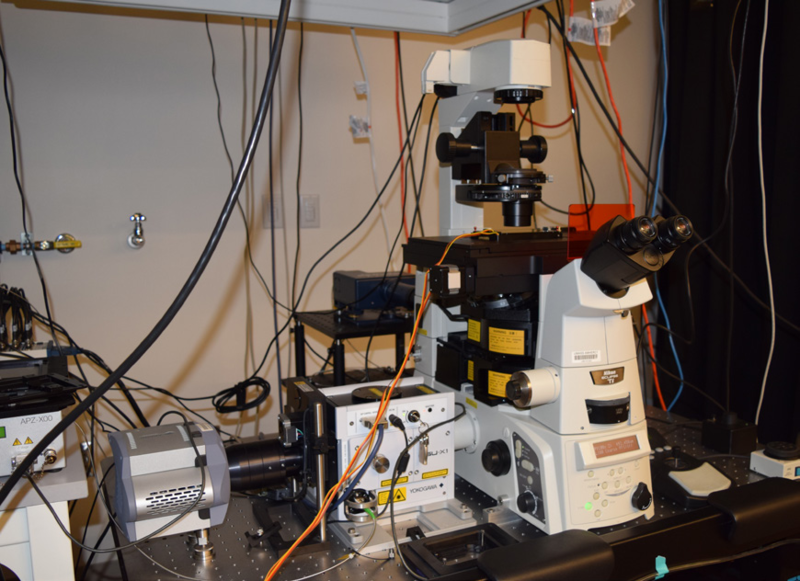 This microscope is great for fixed samples and is especially useful when experimenters may have overlapping emissions from fluorophores or autofluorescence. The 32-channel spectral detector can be implemented with the click of a button and allows for 32 x 2.5 – 10nm bins of fluorescence identification. 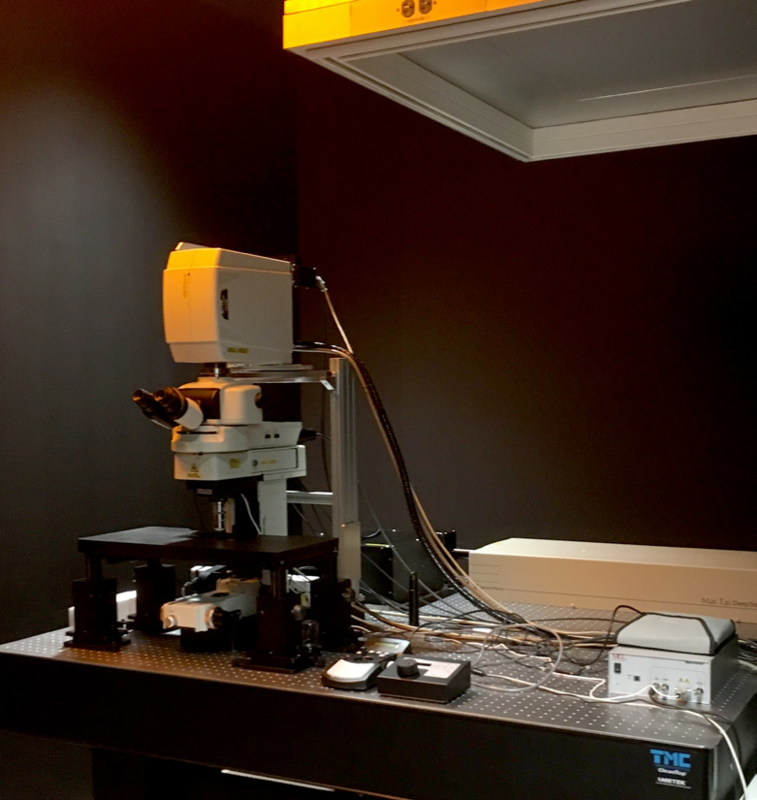 This microscope is an upright, manual microscope that is suited for in vivo, intravital imaging as well as imaging in and through thick tissues and samples. 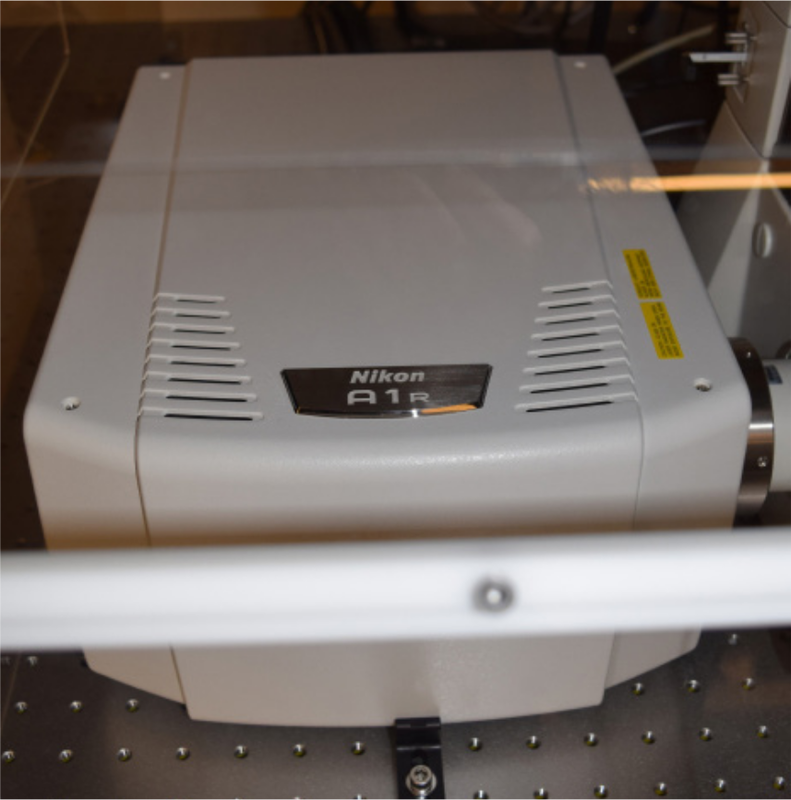 It uses a tunable infrared pulsed laser to excite fluorophores at the focal volume and features a resonance scanner that can image very quickly along with a fast moving piezo nosepiece. We also have visible lasers for standard upright confocal microscopy. 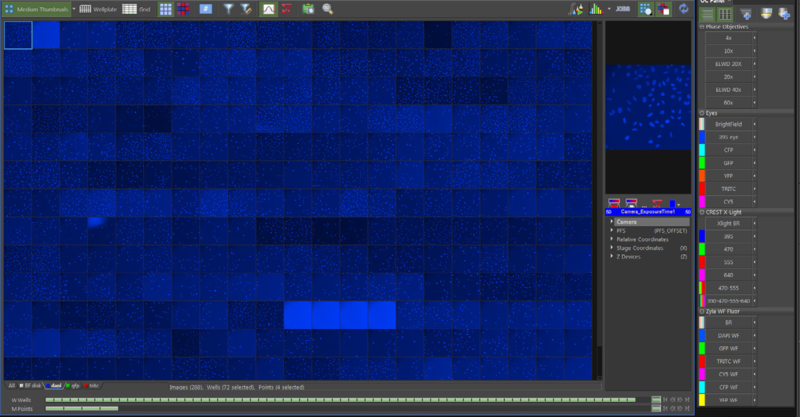 analyze data from live or fixed samples. The intuitive and adaptive software can be programed to count cells, monitor growth, take high-resolution pictures when a certain feature is found, scan slides, scan multi-well plates, etc. A robot can even load your multi-well plates. It has two imaging paths; wide-field and spinning disk. When it is done, you can have the microscope send you a text message that contains any key variables that you need to know right away. Detectors: Widefield with an Andor Zyla sCMOS camera and also a Crest spinning disk confocal with a ProEM camera. This microscope makes doing 3D STORM imaging straightforward. This has STORM-4.0 which includes a cylindrical lens to provide z-information on your molecules of interest. This also has the option to change not only the TIRF angle with the click of a button, but also the direction of the laser entering the back aperture of the objective. 3 PC workstations (WS0, WS1, and WS2) with NIS-Elements and other analysis/computational software available. 4 full size incubators available for use (one has O2 control) Experiments are performed in solution and precious samples may be retrieved. Training generally consists of 2-4 hours per new user and depends on the users previous microscopy experience. All are welcome, even if you have never used a microscope! Training #1 can be accomplished with 1-4 people and consists of a demonstration of the microscope hardware and software, discussions of light paths, digital image acquisition, saturation, and features of the microscope. Training #2 is one-on-one and usually is a brief refresher of training #1 followed by the new user on the microscope acquiring images of a facility-provided sample. Advanced users can bring their own samples. Training #3+ is one-on-one and is the time for the user to use the microscope for their samples. The Trainer will be there to make suggestions/corrections and to be sure the Trainee is going to be able to acquire the data that she/he needs for the project. 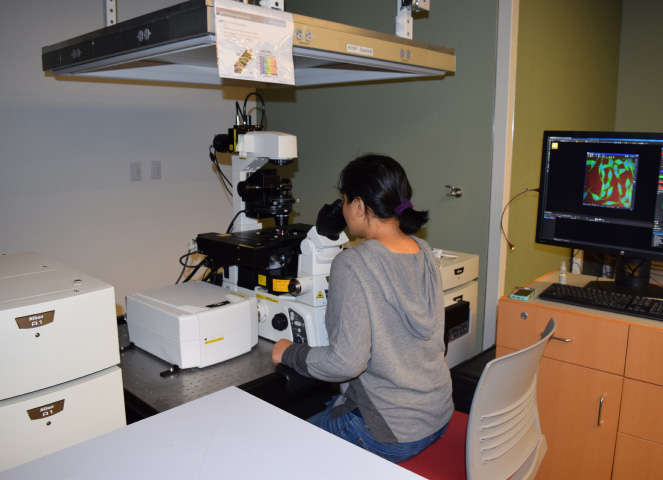 Because all of our imaging microscopes run the same software, NIS-Elements, the training for one microscope is transferable to all of the other microscopes. Dutta, K. et al. Templated Self-Assembly of a Covalent Polymer Network for Intracellular Protein Delivery and Traceless Release. J. Am. Chem. Soc. 139, 5676–5679 (2017). Ikeda, M. Z., Krentzel, A. A., Oliver, T. J., Scarpa, G. B. & Remage-Healey, L. Clustered organization and region-specific identities of estrogen-producing neurons in the forebrain of Zebra Finches (Taeniopygia guttata). J. Comp. Neurol. 525, 3636–3652 (2017). Mann, B. J., Balchand, S. K. & Wadsworth, P. Regulation of Kif15 localization and motility by the C-terminus of TPX2 and microtubule dynamics. Mol. Biol. Cell 28, 65–75 (2017). Mout, R. et al. General Strategy for Direct Cytosolic Protein Delivery via Protein-Nanoparticle Co-engineering. ACS Nano 11, 6416–6421 (2017). Zhu, Y., An, X., Tomaszewski, A., Hepler, P. K. & Lee, W. L. Microtubule cross-linking activity of She1 ensures spindle stability for spindle positioning. J. Cell Biol. 216, 2759–2775 (2017). Bascom, C. S., Wu, S.-Z., Nelson, K., Oakey, J. & Bezanilla, M. Long-Term Growth of Moss in Microfluidic Devices Enables Subcellular Studies in Development. Plant Physiol. 172, 28–37 (2016). Ye, A. A., Cane, S. & Maresca, T. J. Chromosome biorientation produces hundreds of piconewtons at a metazoan kinetochore. Nat. Commun. 7, 1–9 (2016). Ye, A. A., Torabi, J. & Maresca, T. J. Aurora a kinase amplifies a midzone phosphorylation gradient to promote high-fidelity cytokinesis. Biol. Bull. 231, 61–72 (2016). When you have questions about anything, ask the director James Chambers. Treat all equipment with respect. Do not rush when using the equipment as this leads to breakage/damage that you and your PI will be responsible for replacing. Use your allotted time and finish on time when someone is on after you. If you know you will not use your reservation, cancel it ASAP. Adhere to the EH&S-approved live cell standard operating procedure when using live samples. No liquids on the microscope air table. You are responsible for your data – this means that you should arrange for moving it and backing it up. We will do our best to back it up and preserve it, but it is ultimately the user’s responsibility. The facility is very useful to our research. It has more than 6 types of confocal microscopes. Depending on research purposes, we can use proper microscopes. Our samples are not typical samples such as cell. However, these variety of microscopes make it possible to adjust conditions to our specific samples. Make a payment to the Light Microscopy facility.